Looks like Nine Inch Nails won't be letting US presidential hopeful John McCain use any of their songs either - not if the band's current show is any indication. During a sold-out performance Saturday night at L.A.'s Forum, the image of President George Bush that is usually featured on a screen during The Hand That Feeds morphed into the face of current Republican nominee McCain. 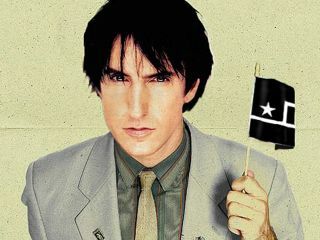 The image was a telling one (and the message hard to miss), aligning with Trent Reznor's concept behind Year Zero - the apolocalyptic events that would occur if the current administration stayed in power through the next election. L.A.'s Forum show wrapped up the first leg of Nine Inch Nails 's current US tour. Next the band will head to South America before returning to the US in late October for another run of dates, including a headlining appearance at New Orleans's Voodoo Music Fest.